The Child Care Center Director's Handbook. Your Guide to effectively managing your duties as a Director. There seems to be very little training that is geared toward teaching Child Care Center Directors how to be an effective Director. In fact, I discovered how to become an effective Childcare Center Director by gaining access to a variety of leadership resources and most of all...by experience! I wrote this handbook out of my struggles as a Director. Yes, I had many struggles, including: hiring the wrong staff, lack of leadership, not effectively managing staff and simply struggling with the many duties of a Director. If you are struggling with managing/hiring/training staff, dealing with parents, making leadership and so many other duites that come along with being a Director;This 16 page ebook is for You!! 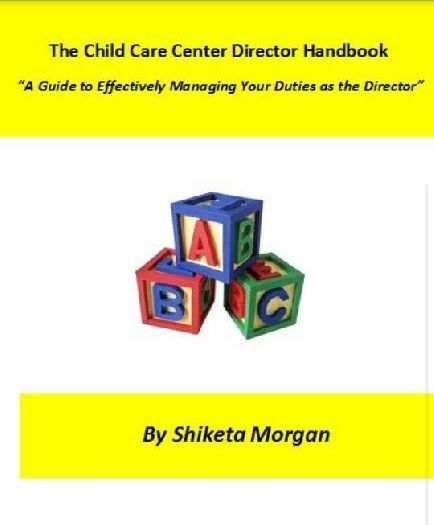 I want to help you to avoid the mistakes that I made and get the information that you need to become an effective Child Care Center Director.